In 2010, with a very small budget, we had the idea of going away on a residential trip with the GI youth group. 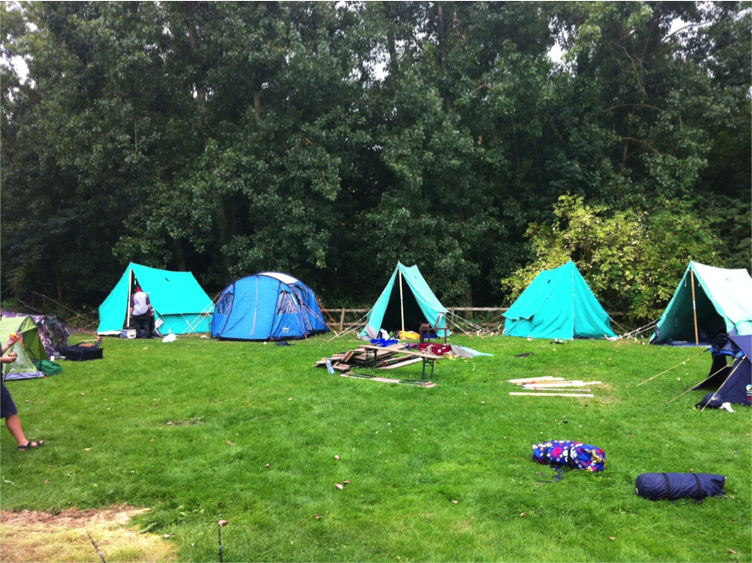 With camping being the cheapest option and something that I enjoyed doing, we took 8 young trans people and 3 volunteers to Debden Campsite in Epping Forest for 2 nights. 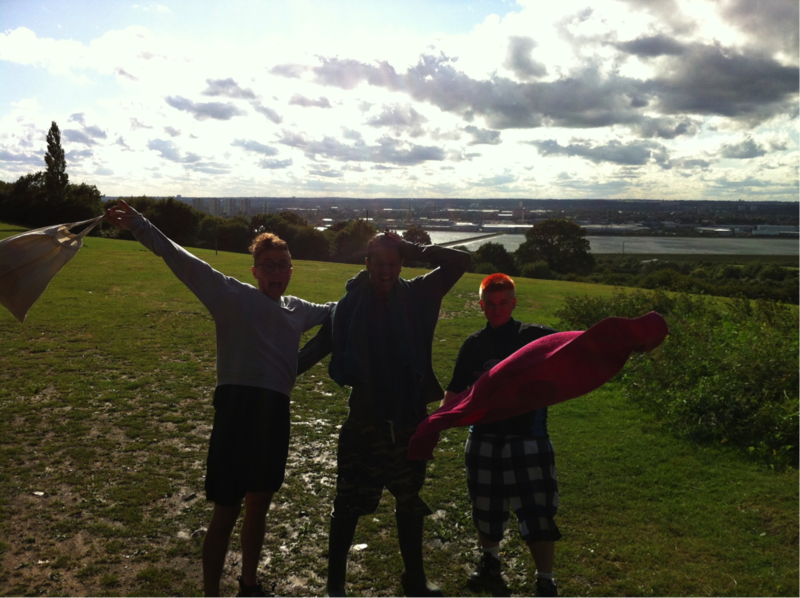 As money was tight, we travelled by tube to Debden and walked 30 minutes to the campsite with heavy packs on our back! Since then things have developed, grown and changed somewhat. We changed our campsite. We took 11 young people for 2 nights. Still not being able to afford a minibus, we got cabs from the station with all the bags in and the group had a 20 minute walk, back pack- free, to the site. 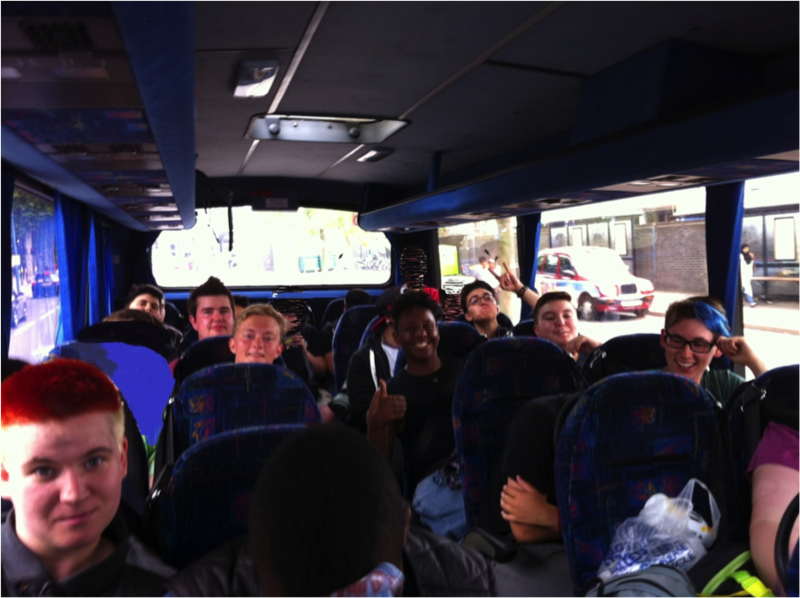 In the third year, we graduated to 16 young people, 2 nights and a minibus! That being said, the minibus was quite small and most people had to sit for the half-hour journey with lots of luggage on their laps. This year, our 4th time camping in 5 years (we didn’t go in 2013), we took a massive 25 young people and 6 workers – for 3 nights! We hired a coach with a driver and had ample room for luggage, sleeping bags and excitement. The idea behind camping is that we can disappear off to a field somewhere and create a little ‘gender haven’ where people’s gender expression is accepted without question, respected and best of all appreciated. It means that we can literally forget the difficulties of being trans in a cis-gendered world, for a few days at least. Before we go away, the staff meet up on various occasions to plan, troubleshoot, go through as many ‘eventualities’ as they can think of and get to know each other a bit better. Then with all paperwork completed, risk assessment done and the needs of the individual young people considered, we set about packing for the weekend! Finn’s clothes… Yikes, knew I’d forgotten something! After an awful weather report for the whole of the Friday, we actually had a very sunny Friday afternoon. Everyone met us on time at Walthamstow Central, apart from the coach! After calling the company we realised that it was at Walthamstow Central, but on the other side of the station. The driver apparently couldn’t get into the car park through the road works, so everyone picked up their stuff and we trekked around the corner to the coach. Our driver was lovely and very soon the coach was packed up and we were on our way with music playing, excitement brewing and good spirits. When we arrived at site, the campsite staff were busy setting up our marquee tent and we set about laying out our tents and beginning to build our camp. The field was smaller than we’ve had in previous years and we had more people and tents to fit in. So we had to plan it out and get people working together in their tent teams but also helping each other to set up camp. The weather held out until we finished building all the tents, then as it got wetter we all took shelter in our marquee kitchen tent. We spent some time before dinner going over our working agreement for the weekend, which after a few days of rain, even though it as inside the marquee, ended up looking like this. Nonetheless, the agreement was stuck to and re-discussed throughout the trip. After a discussion about working together, we managed to organise the kitchen, cook dinner, reorganise the pitching of some dodgily pitched tents and settle down for a candle lit, soggy pasta dinner. Saturday 9th August: Day two or our first full day! Saturday morning started in a relaxed manner, everyone getting up after a rainy night and helping themselves to breakfast and hot drinks. 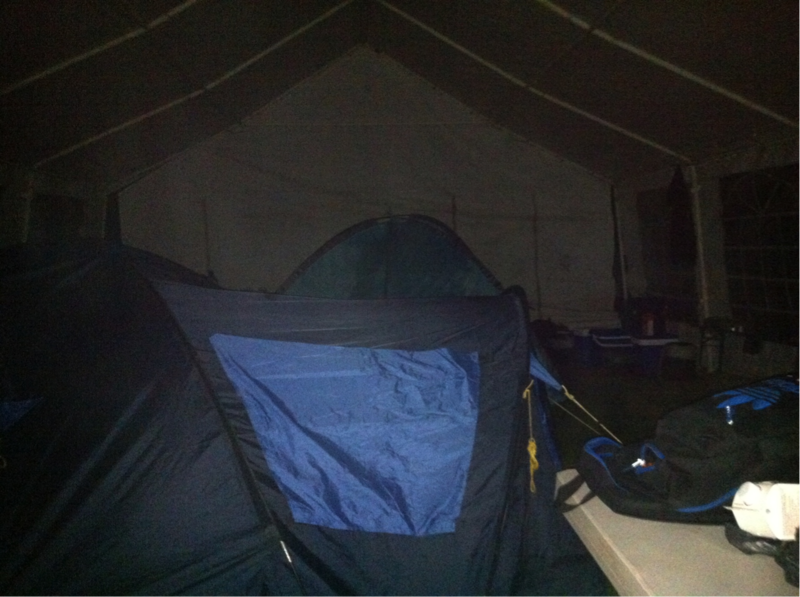 By 10am we had assembled in the main tent again and touched base as a whole group. Everyone went off to get ready for their activities and by 10.30 am we were headed to meet our instructors. 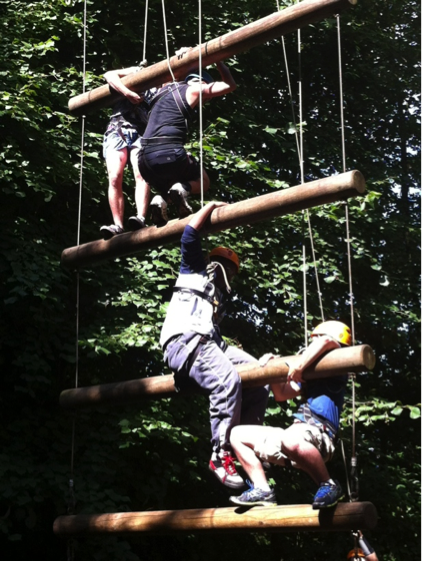 Saturday morning, one group took part in Jacobs Ladder, another raft building and the third archery, all in the sunshine! When we got back to camp, the rafters had a well needed shower after falling in! Apparently their raft stayed together through all of the challenges that the instructors set them, until it came to 10 minutes of free time, when it fell apart and everyone fell in the lake! The Jacobs Ladder climbers did really well, with 6 of the participants reaching the top bar and standing up, 12 metres from the ground! The archers reported on a fun and friendly competitive atmosphere reaching the target, and the two teams had great fun. Then lunch makers got started with preparing salad, sandwich ingredients, fruit and juice. The sun stayed with us so we had a sunny outdoor lunch. We had a chilled out afternoon and by 3pm we were ready for our early evening swim. The sun was still strong and everyone was really looking forward to our exclusive swimming session. We had an hour and a half in the pool on the sunny Saturday afternoon. We played water polo, catch and generally floated about in our chosen swimming costumes with the only worry being not getting hit by the ball during the enthusiastic game of water polo! Chicken, burgers, sausages, veggie variations and pepper kebabs galore, we ate our way into the late evening. 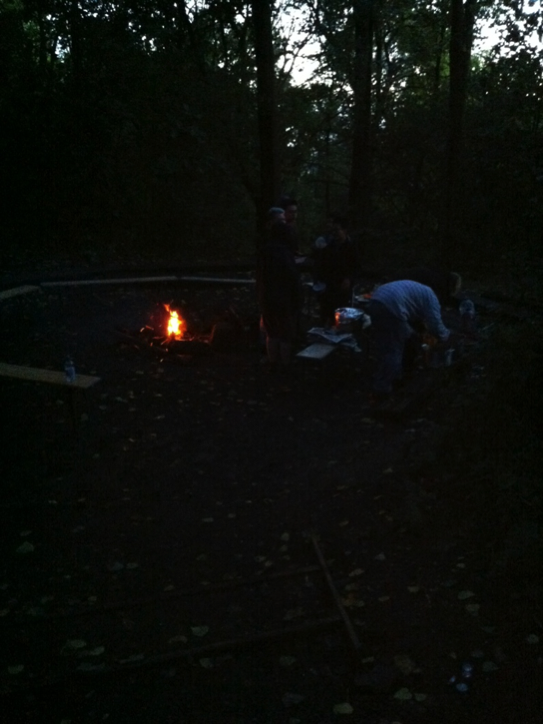 After tidying up we got to have our first campfire, eating chocolate bananas, chatting and sharing thoughts on the day. Saturday night was considerably drier and after a morning re-pitching and adjusting some of the tents that had let in the rain from Friday night, everyone slept well and, importantly, in dry tents! We left the marquee, some more reluctantly and confused than others and headed to meet our instructors. Sure enough, when we arrived at the meeting point, the weather had gotten too hairy for the activities to be safe, so they changed our proposed activities to some indoor ones: gauntlet and indoor archery. Everyone was happy, and the Gilwell staff told us if the weather got better later on they could put on a Kayaking session that we had missed in the morning because of the weather. After the activities and drying off from the morning’s storm, we had lunch in the marquee, and fortuitously Sunday afternoon brightened up completely for the Kayaking session and our 2nd swimming session that evening! Sunday afternoon on the way to swimming: the weather windy yet sunny & happy campers! After swimming and showers, we made two massive pots of vegetable and potato stew to eat with our bread rolls and prepared to eat dinner around the now slightly dried out campfire, for our final evening. After lots of sharing and discussions about what people had thought of camp, some ukulele playing, singing and more chocolate we went to bed for our final night’s sleep. 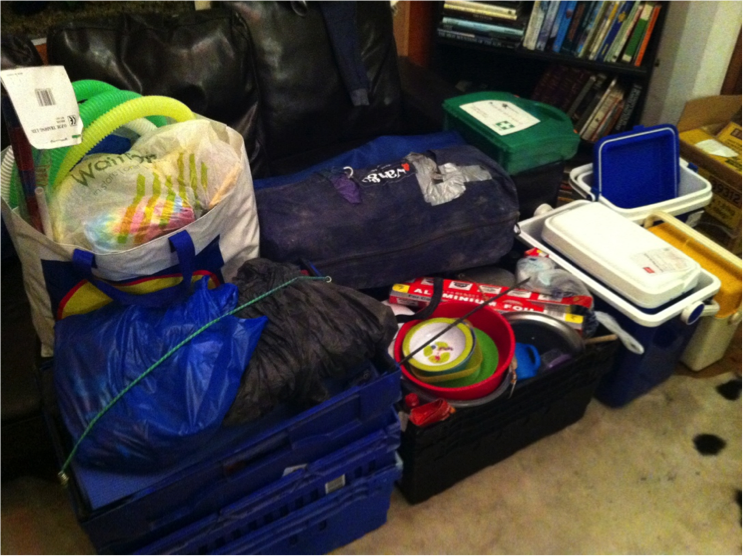 Monday 11th August: Packing up and going home day. After everyone was up, slightly earlier than the previous two days, we showered and ate breakfast. The group were amazing at cleaning up as they went and generally helping out. We got them to pack their bags and be ready for a group meeting mid-morning for instructions on dismantling our tents and communal kitchen area. 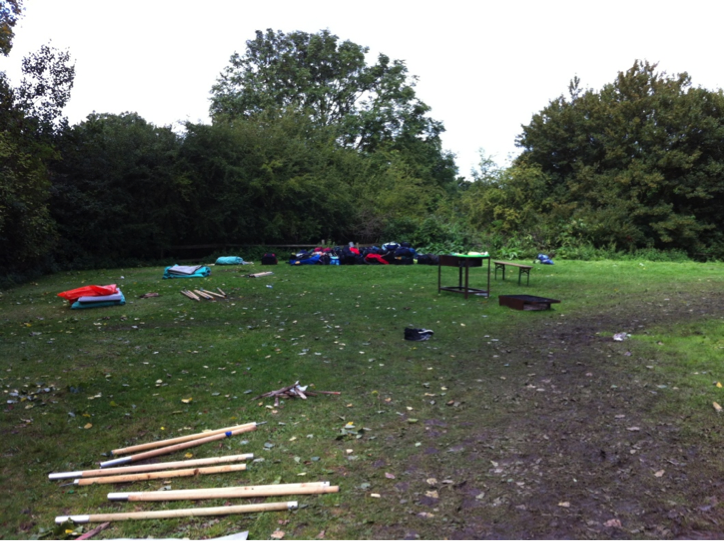 The group set to work as a big team, helping each other to dismantle all the sleeping tents and arrange them in an organised manner for the Gilwell workers to find later. Staff set to work on organising and packing away everything from the kitchen tent, except for any lunch foods and the kettle. We ate a leisurely lunch and drank lots of tea and coffee. After lunch and the lunch clean-up, we had time for a ‘go-round’ on how people were feeling before dismantling the last of the kitchen set up and general camp stuff, tidying and packing Andolie’s car with the staff bags and camping equipment. Before we took everything to the coach meeting point we had time for one last closing circle where everyone sat round, in the sun and we were joined in the middle by one of our friends from the weekend. 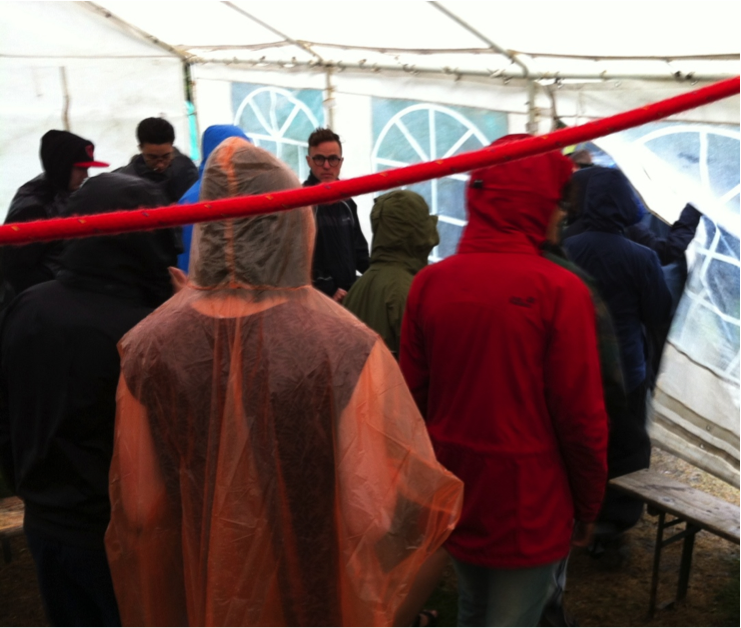 No sooner we had got everything packed onto the coach and most people sat down, the heavens opened again and an almighty downpour of rain accompanied us off site with everyone safely dry in the coach. We arrived at our drop-off point in Walthamstow slightly late due to bad traffic, but pulled in to see some parents and carers waiting to take their tired young people home. Before leaving though, lots of hugs and phone numbers were exchanged, not to mention a few tears! – Keishaun the night worker, our ‘silent’ team member who stayed awake from midnight until 7am, every night keeping everything safe and our marquee from blowing away! – Jay Stewart and Catherine McNamara for preparation support and for being on the end of the phone over the weekend for extra support. But most of all… ALL 25 of the amazing young people for being fun, funny, enthusiastic, caring, thoughtful, kind, strong, willing, experimental, honest, skilled, memorable, curious, sensitive, brave, clever, patient, innovative, prepared and WONDERFUL! 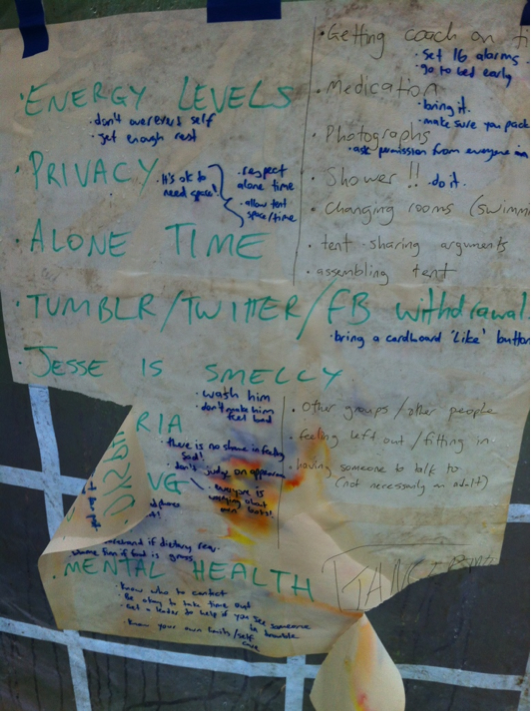 Finn Greig – camping enthusiast, GI youth worker and eternal optimist.